Sometimes the better team wins. Simple as. When you’re simply outclassed in a match, there isn’t a whole lot you can say. Luckily for Munster, there’s a greater picture than just Sarries – there’s a future and more imminently, there’s a Pro12 title waiting to be contended for. Most importantly, many of the players involved at the Aviva will be required in our next efforts for European glory, and so will the management team. This is just a chapter in what is potentially one epic success story, but we must first learn from our mistakes before filling in the blanks. Munster’s classy forward pack showed up at Lansdowne Road with as much, if not more grunt, effort and endeavor as we have seen throughout this truly remarkable campaign. The trouble was, Saracens’ sheer power, coupled with the relentless donkey-work of pack-leader Maro Itoje meant that Munster were never going to produce the all-important clean front-foot possession that has been a staple of the side’s success over the past number of months. As a result, moving the ball from the ruck to carriers was never a straightforward task, and there would have been nobody better positioned to tell you that than the struggling Duncan Williams. Shoveling on sloppy ball and then expecting the 70% fit CJ Stander and company to carry beyond the quickest and meanest of defences in club rugby is far from ideal. And the backs had similar troubles – such was the line-speed of the self-acclaimed ‘wolfpack’, centres Rory Scannell and Jaco Taute often had Saracens defenders in their faces simultaneous to the ball landing in their hands. 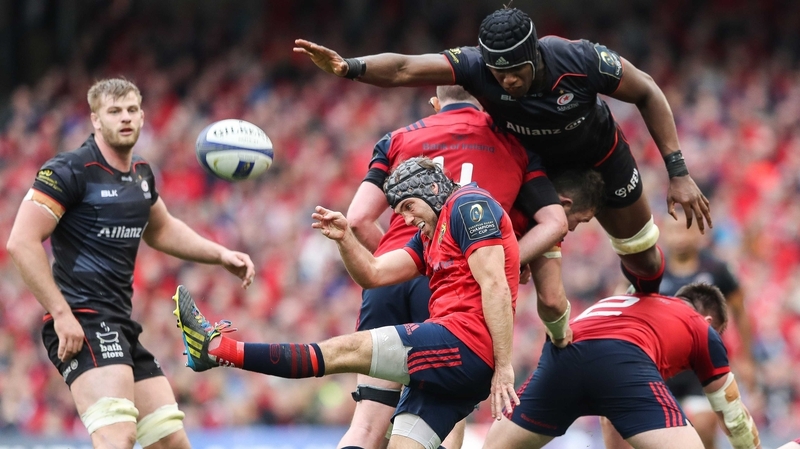 Having forward dominance is vital in any contest, but particularly for Munster’s Springbok-like style. Every now and again, you will face a stronger hand of cards, and God knows Maro Itoje, the Vunipola brothers and Vincent Koch were the four kings on Saturday – but that’s okay – sometimes that’s liable to happen. However, the vivid absence of a plan B and the inability to adapt to the situation, was a little more than worrying. With the exception of Duncan Williams’ trademark dink on the right flank (which was slightly overcooked), not once do I recall Munster chipping in behind the Saracens rush defence. 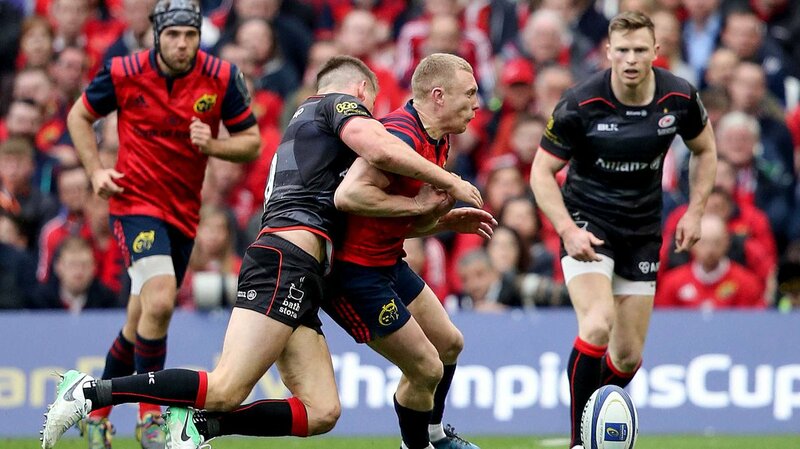 Box-kicks were lofted throughout – many of those rather bizarrely down Keith Earls’ wing; cross-field kicks were attempted now and again -possibly through frustration; but not once did Tyler Bleyendaal dink into the space between the D-line and fullback Alex Goode. Though the Kiwi had an off-colour performance I don’t think there’s an onus on Tyler to take it upon himself to rally the lads and say, “Next time they rush up in midfield, I’m dinking it in behind.” It’s instead one such question asked of the management. You might remember when Munster faced Sarries in the 2012-2013 season, Ronan O’Gara pulled off a masterclass in such a department at a time when Andy Farrell had first introduced the rush-defence into the London club’s culture. Two years later and in 2014 Ian Keatley did his best ROG Vs Saracens impression as Munster reigned triumphant against the same opponents in what was Anthony Foley’s first home European match as head coach. To most rugby supporters, yet alone coaches, that particular chip-kick tactic is a recipe for success against rush defences, yet the usually flawless Rassie Erasmus perhaps missed a trick on this occasion. To the South African’s credit, Rassie has recognized his failings to adapt to each opponent and one hopes he can address this issue for the Pro12 run-in and particularly, for next season. The weekend’s match is history now. Munster certainly could have helped their cause by thinking their way around the field some more, but the side further along their curve came out as winners. No complaints there. History it may be, but nonetheless the players will surely learn from this defeat as they look to carry that experience with them to good effect further down the line. The coaches have learned that in Europe, tactics need to change for each opponent. And us supporters and pundits have learned who can live up to the big occasion, and who has some way to go before playing their part in replicating past Munster glories. This is a learning curve. Supreme behind a dominant pack, but will JJ be the man for our next cup dogfight? 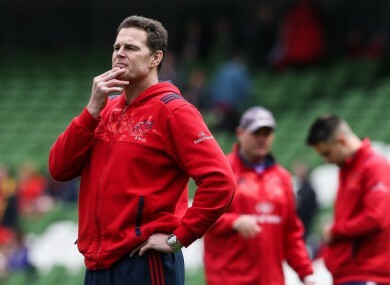 Munster head into next season with some excellent recruitments which will go a long towards addressing some of the individual issues that arose on Saturday. From France, Racing’s petit général James Hart is expected to reliably deputise for Conor Murray while also potentially being the frontline kicker when he starts, with in and around 90% of his kicks in the Top14 splitting the posts in recent seasons. Taking the same flight will be no less than Grenoble’s Chris Farrell, a six-foot-four, sixteen and a half stone, Joe Schmidt-fancied Ulsterman with pace to burn – a transfer which is expected to see Francis Saili depart the province and relegate fan-favourite Jaco Taute to the bench. Speaking of fan favourites, the return of the prodigal son, JJ Hanrahan, will see him lining out in red again for the 2017/2018 season. While he most certainly needs to time to get back up to speed after an unsuccessful spell with the Northampton Saints, he is certainly a man who can give Mr Erasmus a selection headache even for those blockbuster European semi-finals and the likes. With a Pro12 Golden Boot (88.71% success rate in 2013/2014) in his trophy cabinet, one thing’s for sure, Munster won’t be found wanting in the kicking department going forward, as they perhaps were on Saturday afternoon. 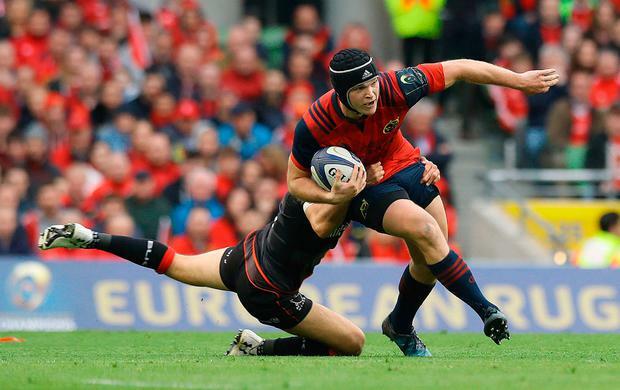 Munster steamrolled half of Europe and got to the semi-final with little experience and areas of weakness. Next season that changes. And if it’s not to be then, there will be even more learned lessons, there will be even more hunger. This team is in safe hands, these things just take time. Ask the class of 2006.